Padma Vibhushan 2019 Winners: Folk artiste Teejan Bai, Djibouti's President Ismail Omar Guelleh, entrepreneur Anilkumar Manibhai Naik, and writer Balwant Moreshwar Purandare will receive the Padma Vibhushan, India's second-highest civilian honour, from President Ram Nath Kovind at the Rashtrapati Bhavan around March. Padma Bhushan 2019 Winners: Kuldip Nayar and Nambi Narayanan are among the 14 names picked for the Padma Bhushan award. 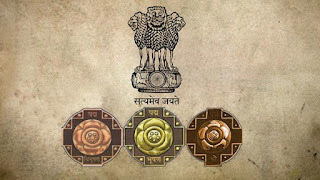 Padma Bhushan 2019 Winners: The list of 94 Padma Shri awardees features actor Manoj Bajpayee, footballer Sunil Chhetri, choreographer/director Prabhu Deva, singer Shankar Mahadevan and freestyle wrestler Bajrang Punia. Complete List of 112 Padma Award winners 2019.